Kathy at Backyard Bird Nerd never fails to inspire me with her amazingly sharp closeups. 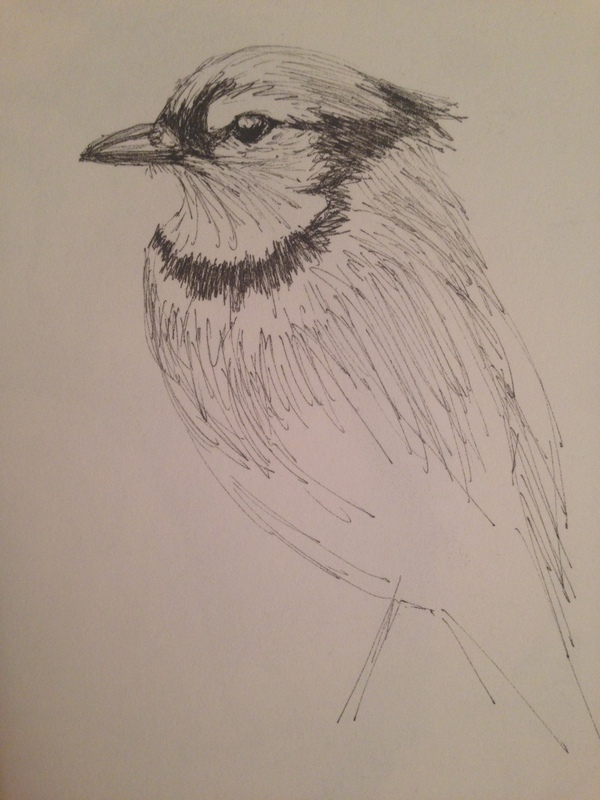 Lately, I’ve been working on getting my blue jay on, after seeing one of her recent posts…..
…and this was my first. I’ve sketched several since, but as sometimes happens, the first was my favorite so far. We’ll see what the week brings! This was done with a Copic SP 0.1mm pen. Love the dark markings on these guys. Hope you enjoyed this! Happy President’s Day! May you have a productive and satisfying week, and lots of time to bring out the paint and pencils. Peace. Thanks so much, John. I’m so glad you enjoyed it. More birds to come this week! Thanks, Kerfe. They are certainly beautiful birds. They are pigs at our feeders and chase the smaller birds but as artwork, they are very striking! Glad you enjoyed. Once again, you have managed to capture his personality. Great job! Thanks, Kathy. More of your birds coming this week! I will look forward to more birds! The toes will be a surprise on the Sloth, haha! Much enjoyed, Laura! A beautiful rendition of Kathy’s fabulous captures! Thanks so much, Donna! Glad you enjoyed! Right? The “here goes nothing” mentality. Then, we try to improve. Big mistake lol. Glad you like this one, Charlie! Tremendous. And that eye! Oy! Thanks, Jill! More to come this week. I’ve been in a birdy place lately lol. This Jay thinks your jay is beautifully done! Suitably characterful – from what I’ve read these guys can be quite rowdy! – even without the telltale blue. Awww thanks Jacob! Boy, they are rowdy; that’s a great way to describe them. I’m glad you’re seeing some personality there. Devilish little things, they are! I zero straight in on the eye – and the expression on this bird is so direct. Bravo! Beautiful Laura. I do enjoy your bird sketches!